It was really hard to pick up a new book after reading Death’s End by Cixin Liu. I was just completely blown away by the monumental brilliance of the whole Remembrance of Earth’s Past trilogy (if you don’t know what I’m talking about, it’s time to grab a copy of The Three Body Problem). After that, the whole literary world felt unambitious and dull. I wasn’t even sure I would ever read a book again. I guess you can call that a massive book hangover. Eventually, I received a notification from the public library for a Canadian science-fiction novel I had put on hold a while ago: All Our Wrong Todays by Elan Mastai. I couldn’t even quite remember what it was about but I picked it up, read the few first pages, rolled my eyes, and resumed my brooding for another week. I am not a genius. If you’ve read this far, you’re already aware of that fact. Well, it doesn’t have to be love at first sight. Special circumstances involving hiding in a room from my 16 months old banging with a spoon on metal cans (or his father) helped me go through the two or three first chapters, in which a confusing narrator does a very good job at describing what kind of hopeless loser he is. Somehow, I still got sucked into the story. In a nutshell, Tom Barren comes from the 2016 that we-in-our-timeline imagined in the mid-20th century: “flying cars, robot maids, food pills, teleportation…”, you get the picture. If the 2016 we know wasn’t like this, blame it on Tom: in his timeline, he stole a time machine and interfered accidentally with a crucial event in 1965 which had made his utopic 2016 possible. His clumsiness rippled in history to produce the lousy, unfair, polluted, war-ridden and Trump-trolled 2016 we know. 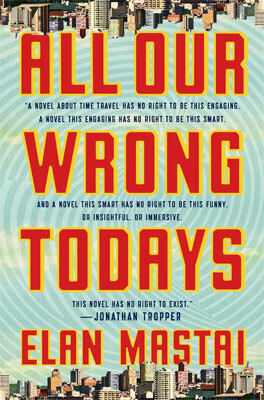 Now, to keep it short: All Our Wrong Todays is an excellent sci-fi novel. It’s a very satisfying time-traveling adventure with all kind of twists. The story is fast-paced, humorous and the chapters are short, which makes for an easy, relaxing read. It’s hard to believe that this is a debut novel, but very obviously, fifteen years of screen-writing—plus a good deal of talent—has made a brilliant storyteller of Elan Mastai. My favourite aspect of All Our Wrong Todays is the character’s personal journey. Time and timelines change, but barely as much as Tom himself. I don’t usually appreciate whiny, self-deprecating characters, but it quickly became apparent that Tom described himself in words borrowed from his disappointed father. The failure to meet high expectations shaped Tom’s personality and his narrative. In other words, Tom is a very human and relatable main character, and you soon find yourself endeared to his confession. Through his ordeals, Tom discovers unsuspected resources and facets of his personality, previously suppressed by a near-hostile environment. Beyond the time traveling, world-messing adventure, the novel is about how environment—from the family cell to the standard of living of our society—affects who we are and how well we perform. This was very inspiring. That’s the magic trick of creating life—it takes every bad decision you ever made and makes them necessary footsteps on the treacherous path that brought you home. Beside Tom’s personal journey, I really enjoyed how the story reverse the traditional pattern and made our world the dystopia: an absurd, archaic, bleak version of the utopic world of Tom. Taking the point of view of the poor horrified Tom, we’re often left with the question: what’s for him in our flawed world? In such an imperfect world, how can he find comfort and happiness? It allows us to reflect upon our world and simply ask ourselves: despite the shortcomings of our societies and technologies, is it all so bad? Despite an edgy sense of loyalty to my timeline and compassion for humanity as a species being stranded on this sad, broken planet, my life is much better. I could go on and on about All Our Wrong Todays but I can’t risk to write a review longer than the book, can I? I would definitely recommend it to any reader in search of an exciting yet relaxing read. This novel is more focused on the human experience of time-traveling than on the tech behind it (hard sci-fi lovers should be warned!) so I truly believe that everyone will be able to enjoy this story, much beyond the science-fiction fans out there. It’s funny, smart and moving and a definitely a recommended read!